Grow your own fresh, fluffy popcorn with this kit that makes it easy and includes everything you need. Homegrown popcorn is the perfect accompaniment to the corny movies your family loves. Plant your own, and in a few months you'll have mature ears of corn ready to shuck, dry, and pop. Start indoors by placing the growing medium into the nutrient-rich, biodegradable pot, and planting the organic seeds—all included in the kit. When the seedling is ready, dig a small hole in your garden and drop the whole pot inside. The roots will push right through it. All you have to do is water it and watch as the cornstalks grow. Made in Illinois. SOOOO ANXIOUS TO TASTE THE FINISHED "PRODUCT"! She can't wait to plant, harvest and pop. What a great experience for children! 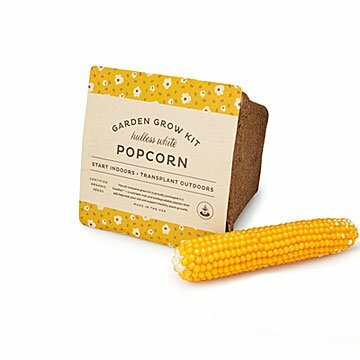 I chose this popcorn grow kit so that the children can grow, harvest and then eat a special treat! This is a great opportunity for children to participate in sharing the responsibility of food acquisition!